Tis the season for heightened emotions. Whether you’re in the process of building your family or already parenting, I hope this Healthy Holidays Tip Sheet arrives in the nick of time. Pictured here are members of what was the Third Thursday of the Month Pre-adoption group at IAC Center in 2007. 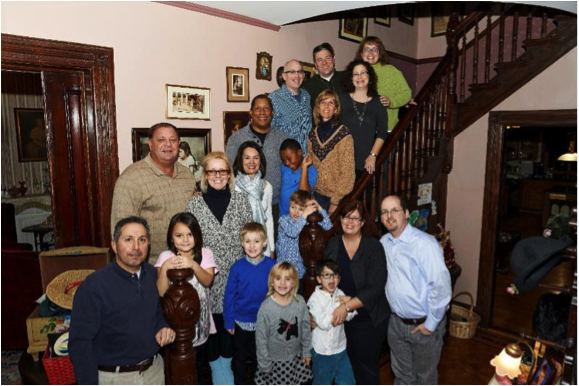 In the 2014 picture that you see here they are celebrating “Friends-giving”- a pre-Thanksgiving event they created and enjoy together each year since they became parents. Theirs is a story of five adoptions, one biological child, several false starts and fallen through adoptions, and above all, support, empathy and lifelong friendships. It is with great joy that I witness our pre-adopt group members move from difficult times to parenting and special friendships for themselves and their children. I have invited these families to share their tips for coping with the holiday season based on when they were waiting to become parents. Let yourself FEEL how you feel and realize it’s OK.
“Having the group was and still is truly a godsend and a life-saver.”Pre-adopt groups are starting in Pennington, Montclair AND NYC. Contact JMantellmsw@gmail.com if interested. Friends-giving is a holiday they created that defines who they are as a group. Special friendships were formed during the most difficult times. And they continue to give to one another in unique and meaningful ways. This group makes me smile and moves me to tears. When I form pre-adopt groups it is always with the hope that they will become lifelong friends. Making deep friendships in adulthood feels different and rarer than when we were children, and so to me these groups represent the gain that comes from sharing the losses and the difficulties.